As Above, So Below – Opens this Week – Zero Equals Two! Featuring an exciting selection of modern masterworks and landmark contemporary art works by Hilma af Klint, Wassily Kandinsky, Steve McQueen, Bruce Nauman, Sigmar Polke, Cameron – many being shown for the first time in Ireland – and new commissions created specifically for this exhibition by Linder, Matt Copson, Stephan Doitschinoff, Alan Butler and others. Opening with a Vedic spiritual blessing at 12.15pm on Thu 13 April 2017, IMMA (Irish Museum of Modern Art) presents one of its most ambitious and compelling shows exploring how the spiritual endures in our everyday lives. In particular, As Above, So Below considers the role played by certain spiritualist and alternative doctrines, such as the occult or mysticism, in the creation of abstract painting from its origins to the present digital age. The arc of this exhibition spans a hundred years from the abstract masterworks of Kandinsky, af Klint and Kupka to contemporary work by Steve McQueen and Bruce Nauman and new commissions by Alan Butler and Linder among others. As Above, So Below resists becoming a comprehensive survey that traces the role of art and spirituality however. Instead, it presents perspectives on spirituality from a range of unique viewpoints in over 200 works, many of which have never been seen in Ireland before. It extends beyond the gallery space with new works made specifically for the IMMA site and a series of performances, events, talks and film screenings taking place during the exhibition. The exhibition’s historical gaze has a particular focus on female artists from the last century whose work remained uncovered until recently in the now shifting narrative of art history. The title, As Above, So Below, echoes an often quoted saying, employed by artists, poets, writers and astrologers alike, as a means to describe and understand the mysterious but familiar world around us. 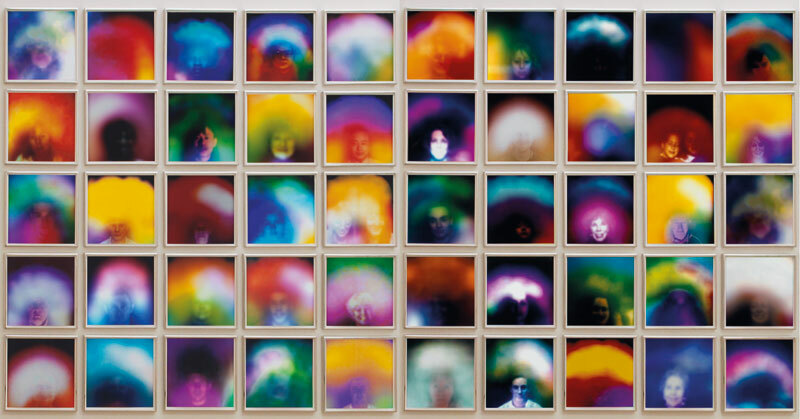 To look at spirituality in such secular times is a provocation in itself, and the exhibition traces and questions the genesis of deep religious, mystical and occult beliefs that continue to shape the ideas of contemporary artists today. Writing in the 1960s, the critic Susan Sontag claimed that, “Every era has to reinvent the project of ‘spirituality’ for itself”, and through this exhibition IMMA asks what the project of spirituality looks like in 2017. Transcending the limitations of what is traditionally perceived as ‘spiritual’, this exhibition embraces the occult, the otherworld, human consciousness, mysticism and ritual, creating a space to reflect and explore these gateways, or portals, to wonder. 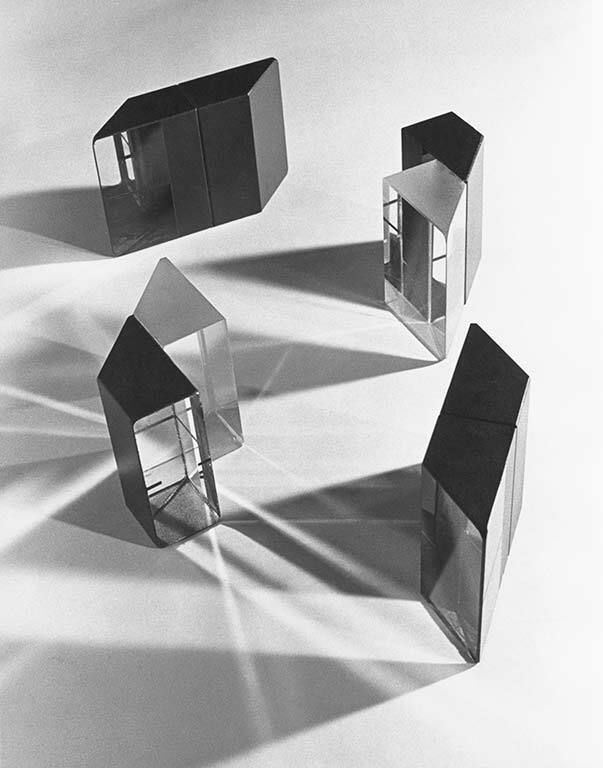 Shown in ‘Chapters’ the exhibition groups works into four thematic sections. The opening chapter Portals looks at how spiritualism is often concerned with entrances into other worlds or other systems of thought. One central protagonist is the recently re-discovered Swedish artist Hilma af Klint who was working at the dawn of the 20th century. 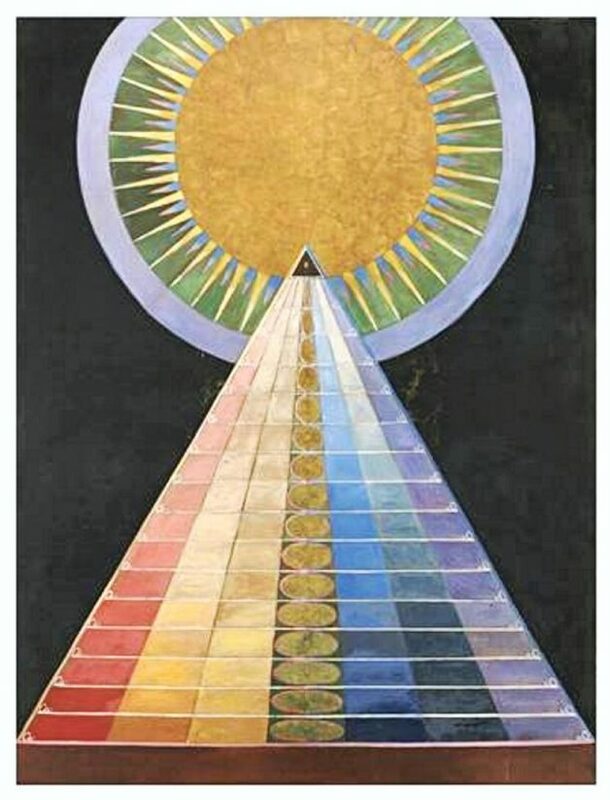 Now understood to be a key founder of abstraction, she was also a theosophist and a medium who understood her ‘automatic’ paintings to be guided by spirits; messages received from the ‘High Powers’. Steve McQueen’s elegant and absorbing film Running Thunder, 2007 (11 mins, 41 sec) also forms part of this chapter as a more contemporary exploration of spirituality. 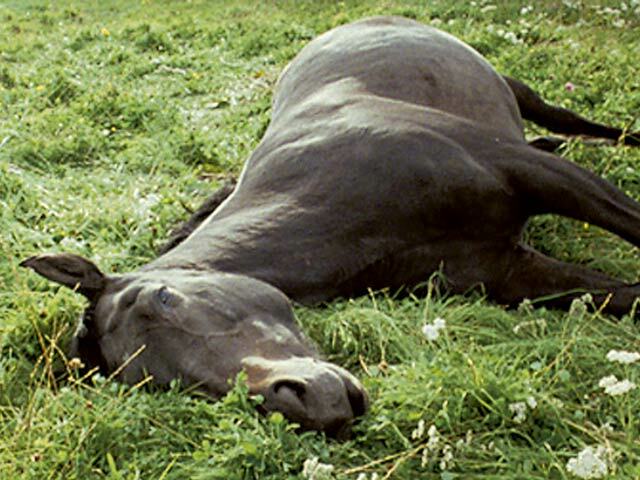 Depicting a motionless horse lying dead – or asleep? – in a meadow it questions stillness and movement, the line between life and death. The second chapter Below takes us into the shadows, into the domain of the occult – of knowledge concealed and only accessible to the properly initiated. One talismanic presence is film maker Kenneth Anger who has a lifelong devotion to the adventurer-occulist Aleister Crowley, stretching back to the 1950s when he helped restore Crowley’s former temple in Sicily. Cameron, an artist, poet, actress and occultist was a follower of the religious movement Thelma, founded by Crowley, as well as being a close friend of Anger’s. Her dark yet whimsical paintings are displayed alongside Anger’s film still Inauguration of the Pleasure Dome, 1954-66, in which she also starred. These works are presented alongside one of Bruce Nauman’s first walk-in ‘environments’, Natural Light, Blue Light Room, 1971. 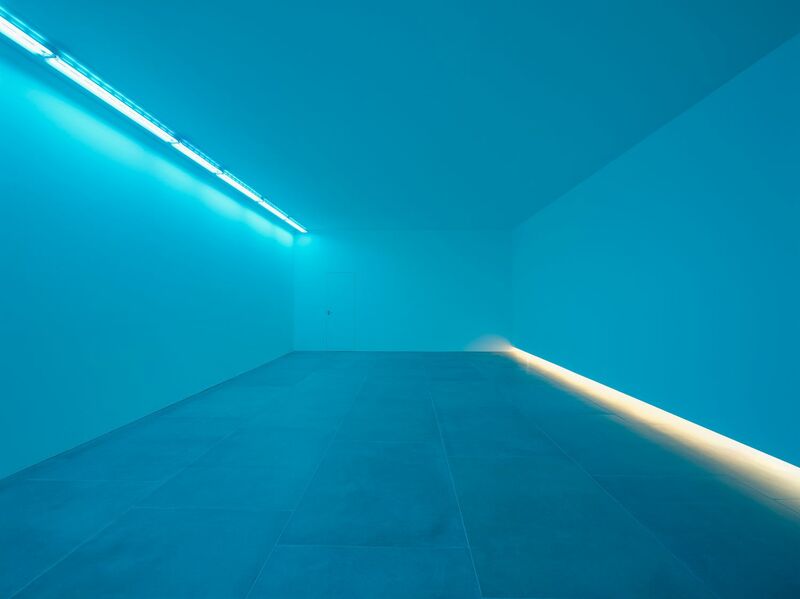 An intentionally disorientating space this work presents a confusing mixture of daylight and glowing neon. Nauman has said of the work; “The idea was that it would be hard to know what to focus on and even if you did, it would be hard to focus”. Indeed Nauman has claimed, through a 1967 work, that “The True Artist Helps the World by Revealing Mystic Truths”, a teasingly ambiguous sentence can be read as earnest, satirical, or both. The third chapter Above is concerned with healing, animism, the attribution of a living soul to inanimate objects, and transcendence. American born artist Susan Hiller describes her photographs of people surrounded by hazy auras as “metaphors for ourselves in the digital age”. These images pay homage to Marcel Duchamp’s curious 1910 portrait of his childhood friend Raymond Dumouchel, who is depicted surrounded by a dark red halo. These mysterious works are joined in this chapter by a new commission from Linder which draws on Victorian séances, which she calls “very performative affairs.” This new piece continues Linder’s unfinished conversation with the little-known surrealist writer and painter Ithell Colquhoun, who developed an ink-blotting process she called “mantic staining” to produce “mind pictures”. A key Irish artist in this section is the painter Patrick Pye, one of the most creative artists in the sphere of religious thought in Ireland in our time. His works, many of which haven’t been seen in public since his retrospective in 2000, infuse this section with heavenly themes which evoke the role of man and his biblical aspirations. The final chapter Beyond includes artists who have challenged the notion of spirituality. This section concerns endings, death and alternative options. It is about leaving this world, about what dreams may come, and takes its cue from the digital age. The enduring ideas of the spiritual are brought into question in fantastical ways by artists such as The Propeller Group, presenting a journey through the funeral rituals of Vietnam. The film merges documentary footage of processions with stunning re-enactments– a rumination on death. This is presented alongside the transformative works of the American visionary artist and architect Paul Laffoley. This exhibition is presented as part of an exciting on-going initiative, New Art at IMMA, proudly supported by Mathewson, which allows IMMA to continue to support artists’ vital work in a strand of programming that recognises and nurtures new and emerging talents, new thinking and new forms of exhibition-making.“ Nurturing new talent and thinking is central to what we do at Matheson. Our involvement in New Art at IMMA is an exciting way for us to support and connect with IMMA and with the artists who are involved in this element of its programme.” Tim Scanlon, Partner and Head of Corporate, Matheson. Cameron, Untitled (Mystical Landscape with Spirits), undated. Watercolour, ink and varnish on posterboard 36.8 x 47 cm. Courtesy Cameron Parsons Foundation and Nicole Klagsbrun. Photo: Christopher Burke Studio. Doitschinoff, Hayden Dunham, Stephen Dunne, Susan Hiller, Koo Jeong A., Alejandro Jodorowsky, Wassily Kandinsky, Rachid Koraïchi, Emma Kunz, Frantisek Kupka, Paul Laffoley, Liliane Lijn, Linder, Josiah McElheny, Steve McQueen, Henri Michaux, Pascale Montandon-Jodorowsky, Pádraic E. Moore (curatorial advisor), Bruce Nauman, Austin Osman Spare, Sigmar Polke, The Propeller Group, Patrick Pye, John Russell, Eoghan Ryan, Aura Satz, Suzanne Treister, Grace Weir, amongst others. Museum Closed Good Friday 14 April. except for occasional special exhibitions, including the IMMA Collection: Freud Project which is €8/5 and Free for U18, IMMA Members and full time students. Free to all on Tuesdays.